Low cost RFID school attendance system, with a simple Excel spreadsheet with VBA macros. 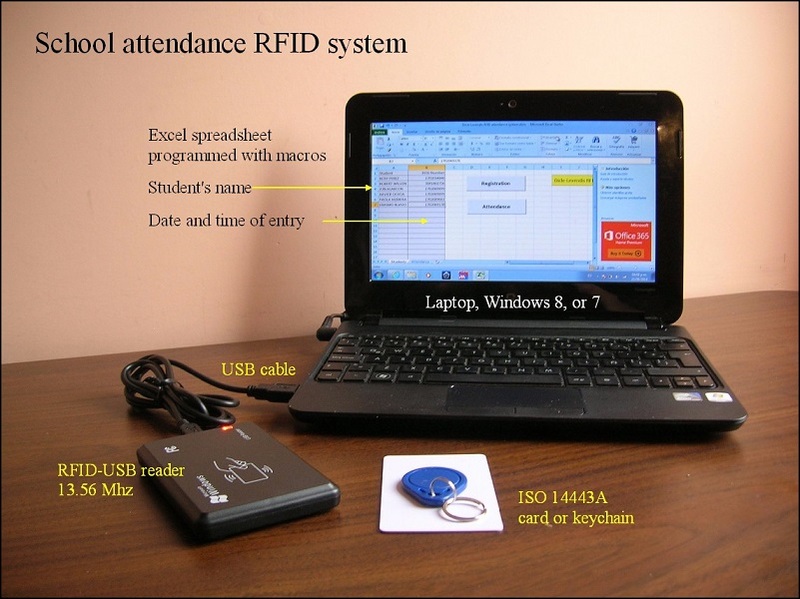 Using low-cost devices, as is a RFID-USB reader 13.56 MHz with ISO-14443A tags, cards or keychain, the authors of this project developed a simple control for recording attendance of students to enter the classroom. The system can be extended to other applications, for example to control employment assistance, access control, inventory control, etc. 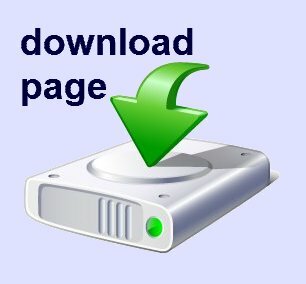 Using the basic teaching tool for any teacher which is the Laptop computer and an Excel spreadsheet programmed in VBA, you can store all attendance records, including the name of the students, along with the date and time. Records are stored automatically in a standard Excel file, which can later be used by other software to integrate the semi-annual monitoring or assistance to the class. The total investment of the system, in a class of 40 students, is around $2.00 U.S. per each alumni. The RFID-USB reader device receives information from ISO-14443A type tags. These tags are sold in presentation of card or keychain and contain an EEPROM with capacity of 1 Kb of data storage space. 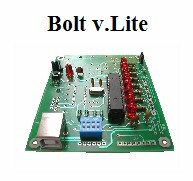 This project tests were performed with both types. This is an RFID-USB 13.56 MHz, very easy to use modular reader. It can be used in many RFID applications such as personal identification, logistics, access control, attendance control and process control industry. When connecting the USB cable to your PC or Laptop, the RFID reader-USB module is detected (plug & play) from any Windows 8 or 7 system, installing its driver automatically. 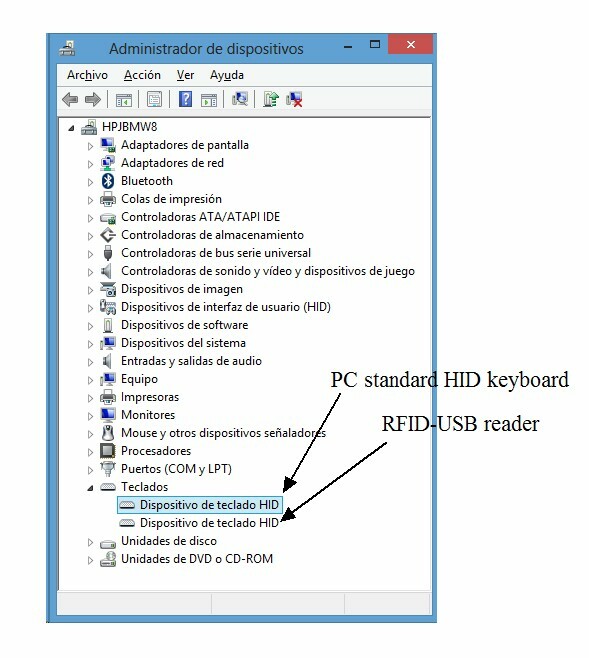 The device is recognized and listed by the device manager as a HID keyboard, as shown below (Figure 1). Notice how on the list there are 2 keyboards, one of which is the standard computer keyboard and the other is the RFID-USB reader. By bringing the RFID tag near the reader (the approximate detection distance is about 2-4 cms), it reads the tags serial number and sends it to the computer as a string of 10 characters. Since the device was installed as a HID keyboard, this string can then be directly observed in any Word, Excel or Notepad document as if it were a user typing on a standard computer keyboard. 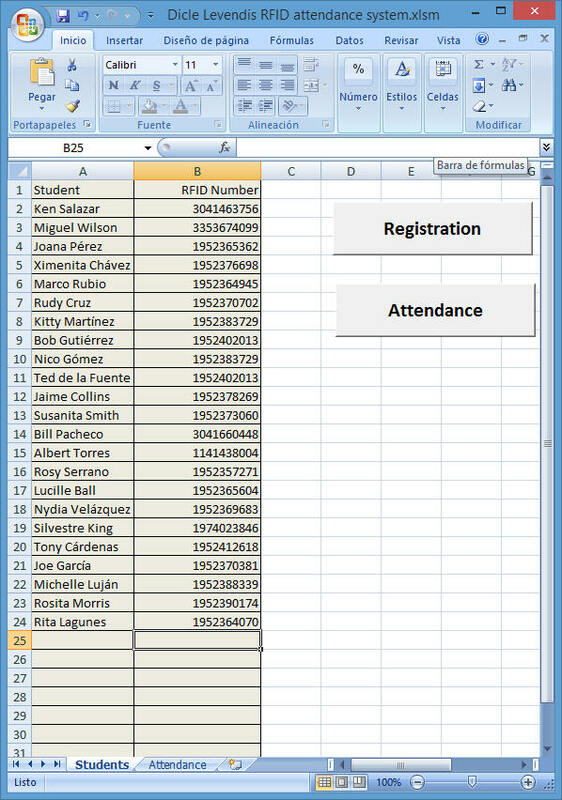 Using the Excel-VBA program (link is provided at the end on this page), the attendance control system is complete: as each student enter the classroom, his/her tag's serial number, student name, date and time will be automatically stored in the Excel sheet (see Figure 4). For initial registration, in the folder 'Students', the names of the students must be written in the appropriate column (see Figure 3). Thereafter, by positioning the cursor on the Excel sheet cell to the right of each name, the student must bring his/her tag to the RFID reader, about 2-4 cms. away, to enter the serial number in the corresponding cell. Registration should be done only once. (*) Message from the authors: We are providing the software under GNU General Public License. We provide the code as is and with no warranties. It may have errors. If so, please report them to us. We are academics and we provide our work-product free for anyone to use as long as it remains free. What is in it for us? Your recognition and citations. We try to keep a record of instructors using it. We would appreciate if you could send us an email and let us know that you are using it. 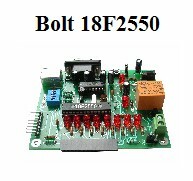 MF522 RFID module connected to Bolt 18F2550, with visualization of data in mobile smartphone. 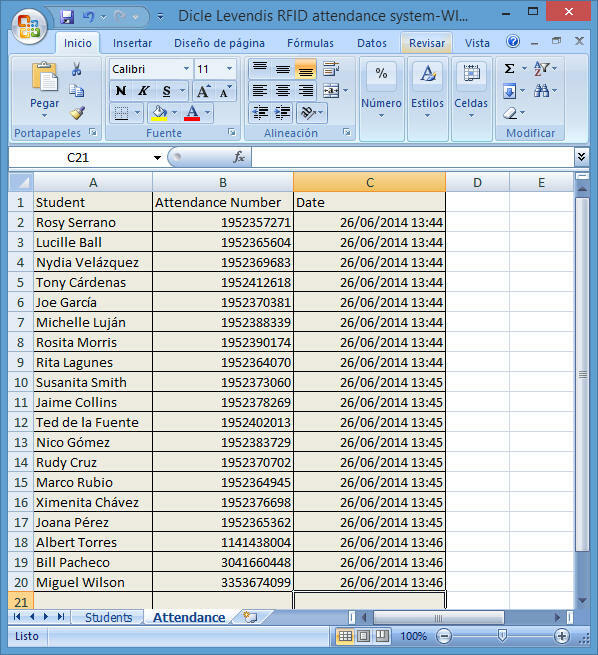 Low cost school attendance RFID system, using an Excel spreadsheet.